Reform advocates are making a compelling case for policies that take aim at mass incarceration. California voters get their say on so many initiatives every election cycle that it can be difficult to separate the trivial from the significant. But there was no mistaking what happened when the Golden State’s electorate gave Proposition 47 a 20 percent margin of victory this past November: an earthquake was unleashed in the world of criminal justice. The tremors have reached as far as Texas and New York, where prison reformers are looking at Prop 47 as a model for their own proposals. By reclassifying six low-end drug and petty-theft felonies as misdemeanors, Prop 47 removed an estimated 40,000 people per year from the prison pipeline. Most of these men and women initially serve only a few months, but the consequences—restrictions on employment, barriers to access to government benefits and a high likelihood of reincarceration—last a lifetime. The reform was designed to invest the savings, estimated by the Legislative Analyst’s Office to be up to $200 million annually, in mental health programs, drug treatment, early education and other infrastructure. Prop 47 also allows an estimated 10,000 prisoners to petition judges to reduce their sentences based on the new reclassification of their crimes. Perhaps most important, it allows all state residents who have been convicted of one of these felonies to apply to get the crimes removed from their records. By some calculations this will dramatically improve prospects for more than 1 million Californians. “The sheer volume of potential impact, year over year, is absolutely huge,” explains Robert Rooks, organizing director at Californians for Safety and Justice (commonly called Safe and Just), whose 501c(4) arm, Vote Safe, was behind Prop 47. “It’s not just another state policy reform. It’s unlike any we’ve seen.” What made the victory all the more remarkable was that it was won in a low-turnout, off-year election—a scenario that traditionally skews votes to the right. Yes votes piled up not just in traditionally liberal coastal cities, but also in conservative inland counties. According to Lenore Anderson, Safe and Just’s forty-three-year-old executive director and chair of the Prop 47 campaign, the vote sent “a very strong signal” that Californians are fed up with mass incarceration and prefer to focus state resources on improving community health. Anderson, a military brat who once dreamed of becoming a drummer in a punk rock band, was chosen by the Open Society Foundations’ Justice Fund and other big funders to head the newly conceived organization in 2012. As the Prop 47 campaign took shape, she built a coalition of advocacy groups like the ACLU and the Ella Baker Center for Human Rights, at which she had worked after she graduated from law school at NYU. The Prop. 47 campaign was also joined by a surprising cross-section of public figures, including Senator Rand Paul, former House Speaker Newt Gingrich and conservative philanthropist B. Wayne Hughes Jr. Other partners included the Open Society Foundations; senior law enforcement figures like Bill Lansdowne, onetime head of the San Diego police department; San Francisco District Attorney George Gascón; several prominent victims’ rights advocates; and hundreds of religious leaders from around the state. The campaign was boosted by support from reform proponents who couldn’t be painted by opponents as being “soft on crime.” Prominent among them was Dionne Wilson, the widow of a police officer killed in 2005 by a young addict, who had, in the immediate wake of her husband’s murder, pushed for the shooter to be sentenced to death. At community forums around the state, Prop 47 supporters like Wilson argued that they were being “smart on crime,” diverting scarce state dollars into interventions that actually made communities safer rather than simply locking up low-end offenders at the eye-popping sticker price of $62,000 per inmate per year. In the years after her husband’s murder, Wilson had embarked on an extraordinary personal journey. Seeking to cope with her grief and anger, and to understand the lives of those on the other side of the criminal-victim divide, she began volunteering with the Insight Prison Project. Every Saturday she talked with convicted killers in San Quentin through the Victim Offender Education Group; she even wrote a letter to her husband’s killer in which she forgave him and asked him to forgive her for having pushed for the death penalty. Campaigning for Prop 47, she shared her hard-earned insights about all the chaos and untreated addiction and sickness that often provide a backdrop to criminal behavior. Wilson and others thought Anderson was the perfect leader to spearhead a campaign like Prop 47. By the time she founded Safe and Just, Anderson was widely recognized as one of the leading voices for criminal justice reform in California. A lawyer by training, she had won an Open Society Institute fellowship for her work with the parents of incarcerated children. Later, she directed the San Francisco Mayor’s Office of Criminal Justice, then worked with District Attorney Kamala Harris (who is currently serving her second term as California’s attorney general). Over time she developed expertise on neighborhood blight issues, gangs, domestic violence and witness protection. From her office in Oakland, on the second floor of a glass building near Oaksterdam—the country’s only marijuana-studies university—Anderson worked on fundraising and coordinated messages for the Prop 47 campaign. She also strategized about how to get conservative voters to give the message a chance. Tell stories, she urged her team. Humanize the issue. 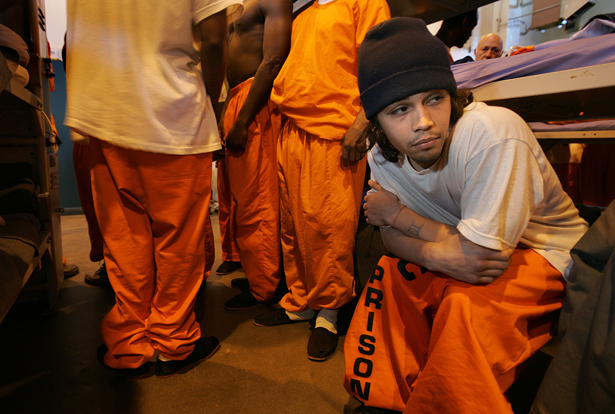 With more than 1,000 new crime bills written into California’s penal code over the past quarter century, the state’s prison system had become so bloated, Anderson believed, that poor people in faraway neighborhoods were no longer the only ones who ended up behind bars. It was a fair bet that most people in the state knew someone who knew someone who had been incarcerated for drugs. And that, she argued, was where the reformers had a good shot at connecting with voters. In the 1980s and ’90s, reformers had limited success raising awareness about the high financial and social costs of the state’s lock-’em-up policies. During these years, voters and their elected leaders would essentially shrug their shoulders and cast their lot with incarceration-first strategies, whatever the evidence. The first chinks in California’s carceral armor appeared in the late ’90s. The state legalized medical marijuana in 1996. In 2000, Proposition 36 provided treatment for low-level drug users as an alternative to incarceration. Twelve years later, another Proposition 36 passed; this one limited three-strikes convictions to those whose third strike was a serious or violent crime. In addition to reducing the number of new three-strikes cases, the second Prop 36 applied retroactively, allowing thousands of people who had been convicted of nonviolent third strikes in the past two decades to apply for resentencing. But despite this troika of reforms and a series of federal court rulings ordering the state to reduce its massive prison population—the overcrowding problem had grown so serious that the court found the state unable to deliver constitutionally adequate medical and mental health services—California’s prison numbers remained dismally high. Even Governor Jerry Brown’s public support for “realignment,” a process that nudges low-level offenders out of the state system and down to the county level, had little effect. Anderson believed that the persistent problem created a window of opportunity. The earlier reforms had not caused the sky to fall, but big challenges remained. Consequently Prop 47 advocates felt that voters might be willing to gamble on a larger reform in November 2014. Frame the issue right—talk about being “smart on crime,” as Kamala Harris had done in her successful 2010 campaign for attorney general—and California’s tough-on-crime consensus could be smashed. The Open Society Foundations agreed to pony up $1 million annually for Safe and Just, and a subsidiary institution, the Open Society Policy Center, added $1.25 million more to fund the Prop 47 campaign. Once the money began to flow in, Anderson hired Ace Smith, a PR expert who knew how to shape a policy pitch as well as anyone in the state. Anderson also began talking to other major donors about how to push transformative change through the initiative process. Although gaining support from funders like OSF and Hughes was crucial, the campaign team was clear from the outset that the Prop 47 campaign couldn’t simply be a big-money initiative. Mobilizing at the grassroots level was equally important, Anderson believed. With this goal in mind, she put together a group headed by Robert Rooks, a longtime criminal justice reformer, to liaise with the state’s trade union movement and get organized labor on board. She also worked with a team in Los Angeles to earn support from big-name artists like Jay-Z. Many law enforcement groups remained vocal opponents throughout the campaign. But others, responsive to Gascón and Lansdowne’s message, ended up sitting the fight out—their silence a tacit rejection of the lock-’em-up policies of the past. The assumption that the police, the DAs, the sheriffs, the prison guards and victims’ rights groups were monolithically in favor of an ever-expanding incarceration system no longer held. On election day, all the strands that Anderson had been weaving for the past two years came together perfectly. A campaign built on the premise that you need 50 percent plus one vote to win ended up with support from 60 percent of the state’s voters. In the big cities, where communities have been hardest hit by incarceration, the victory was particularly lopsided. But even in conservative counties, support was surprisingly strong.